Thank you Barleans for sponsoring today’s recipe. As always, all opinions are my own. My family loves smoothies. What family doesn’t though? It’s an easy way to get in a few extra servings of fruits (and sometimes veggies). My husband, Jon, is the smoothie king in our home. He makes the best smoothies and typically makes us smoothies at least once on the weekend. True story, he made this Pineapple Banana Peach Smoothie on a whim and after having a few sips I made him stop drinking his smoothie so I could photograph the smoothie. This is true life of a food bloggers family. They are aware at any given moment they might have to stop eating/drinking so one can document. He just smiled and laughed and complied to my request. Jon knew right then and there that his smoothie was a hit! If I want to document it–he knows its Katie’s Cucina approved. 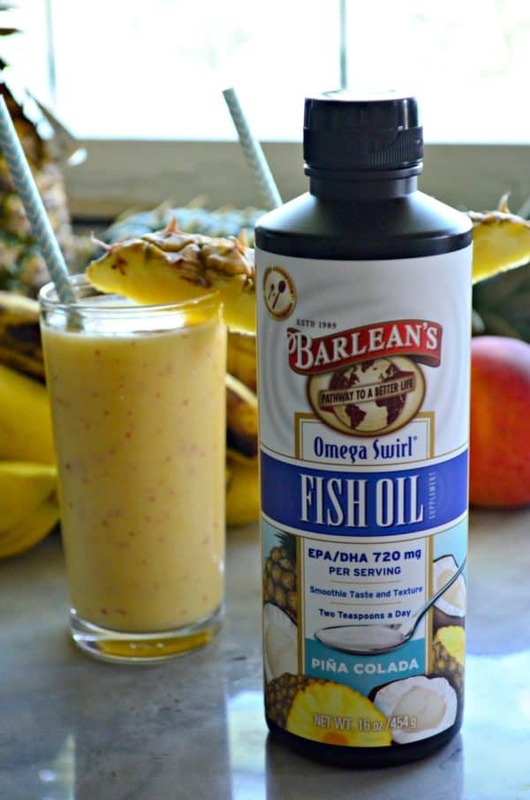 I recently received Barlean’s Fish Oil Omega Swirl in Pina Colada flavor. I was a little hesitant/skeptical at first but gave it a try live on my Instagram stories a few weeks ago. You guys, it’s delicious! And best of all, no fishy burps afterwards! 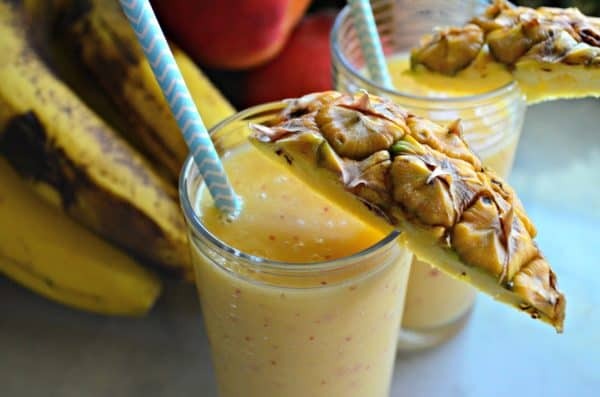 As Jon was making the smoothie he knew that the sweet banana, peach, and pineapple had enough natural sugars in them to warrant no additional sweetener in this smoothie. He looked at me and said “we should put some of that new Pina Colada swirl you got in the smoothie”. I happily smiled and handed over a teaspoon and the bottle. You see, he’s not big on extra healthy (earthy crunchy) type stuff. Some days I have to sneak extra stuff in his food just as I do for our toddler. So the fact that he wanted to add in the “healthy” made me oh-so happy! Don’t get me wrong–he eats healthy and relatively clean but he’s not a kale and quinoa guy by any stretch of the imagination. So with that being said, the fact that he even likes this Omega Swirl was a big win in my book! 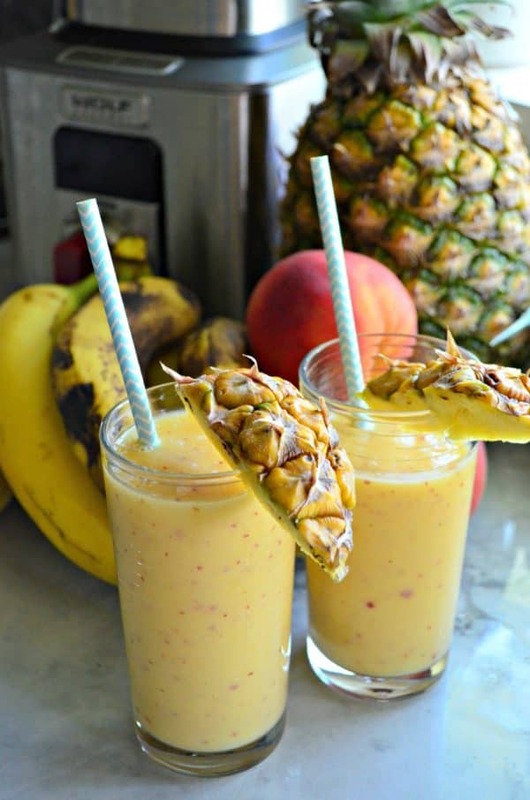 This Pineapple Banana Peach Smoothie is the perfect summer smoothie. We love our Wolf Gourmet Blender. It’s a high-power blender that purees and pulverizes the fruit and ice in no time. We opted to not peal the peach because we knew the blender could handle it. We placed all the ingredients in the blender and within a minutes time we had a delicious smoothie. Whether your looking to add it to your breakfast or enjoy it as an afternoon snack or even dessert. 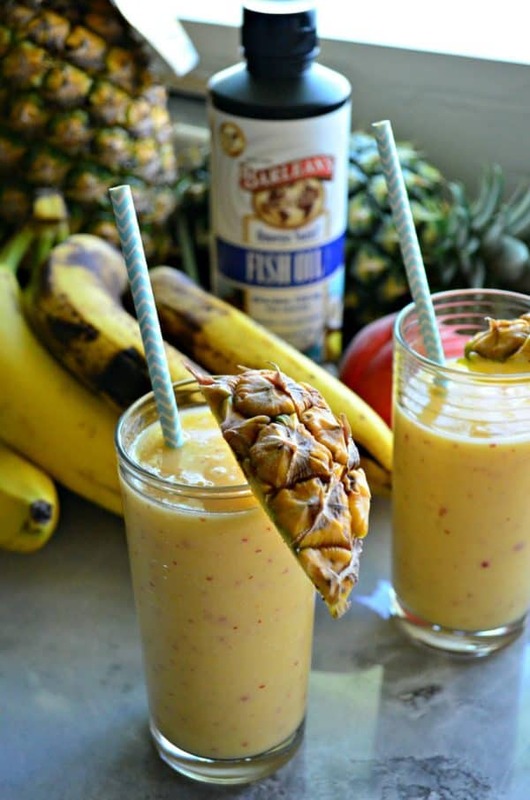 This combination of summer fruits are delicious and you’ll never even know that Barlean’s Fish Oil Omega Swirl in Pina Colada flavor is in the smoothie! 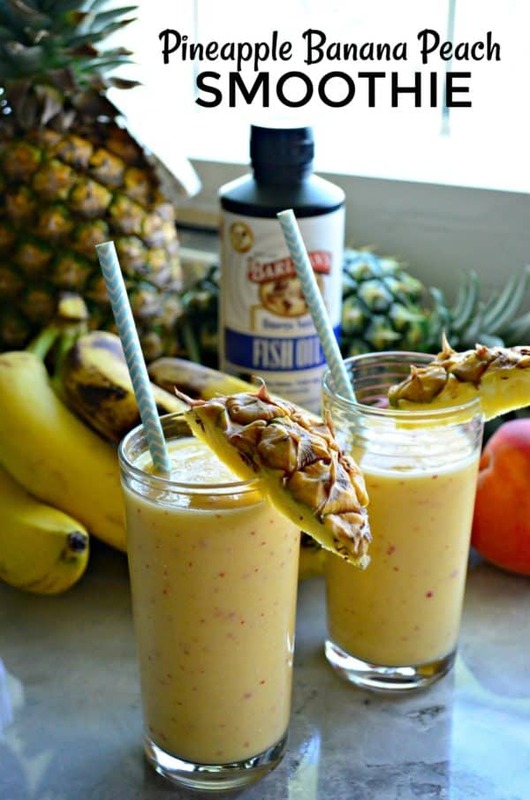 In a high-powered blender place the ice, banana, peach, pineapple with a little bit of its juice and 2 teaspoons of the Barlean's Fish Oil Omega Swirl Pina Colada. Blend for 45 seconds on high or until the fruit and ice are smooth. Divide evenly between two glasses and garnish with additional pineapple if desired.